HP High Court Process Server Syllabus 2018. HP High Court Junior Office Assistant(IT) Syllabus 2018. HP High Court Judgment Writer Syllabus 2018. HP High Court Stenographer Gr.-III Syllabus 2018. HP High Court Clerk Syllabus 2018. HP High Court Notification is out. HP High Court is recruiting for 80 Clerk, Steno and Other Govt Job Posts. 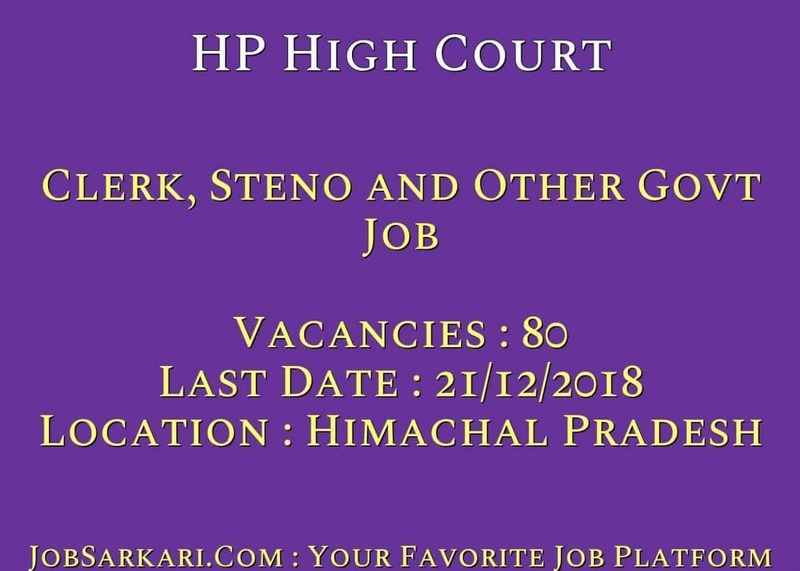 You can check HP High Court - Himachal Pradesh High Court last date, download HP High Court notification, visit HP High Court official website and check other HP High Court Vacancy details.Complete Vacancy and recruitment Details about 80 Clerk, Steno and Other Govt Job vacancies in HP High Court are provided below by JobSarkari.Com only for you. Last Date for Apply Online 21/12/2018. Clerk (Class-III) Candidate Must Have Passed Graduation in Any Stream. 31. StenographerGr.-III (Stenotypist) (Class-III) Candidate Must Have Passed Graduation in Any Stream With Typing Speed of 80 W.p.m in English Stenography and Typing Speed in English at 40 W.p.m. on Computers. 06. Judgment Writer (Class-III) Candidate Must Have Passed Graduation in Any Stream With Typing Speed of 80 W.p.m in English Stenography and Typing Speed in English at 40 W.p.m. on Computers. 21. Candidate Must Have Passed B.Tech / MCA / B.Sc. (IT) / PGDCA or 12th Pass With BCA / DCA or ITI in Computers With 02 Years Experience as System Assistant. 02. (Class-IV) Candidate Must Have Passed Class 12th. 20. Total No of Post 80. 1.Written Test / Skill Test. 6.Online Application Can be Submitted on or Before 21st December 2018. Q. What is the Last Date For HP High Court Clerk, Steno and Other Govt Job Vacancy ? A. Last Date for HP High Court Clerk, Steno and Other Govt Job Posts is 21/12/2018. Q. What is the Form Type of HP High Court Clerk, Steno and Other Govt Job Recruitment ? A. The Form Type for HP High Court Clerk, Steno and Other Govt Job Posts is Online. Q. 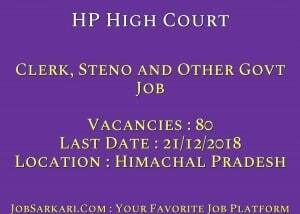 How many vacancies are available in Himachal Pradesh High Court Clerk, Steno and Other Govt Job Posts ? A. There are about 80 Vacancies in Himachal Pradesh High Court Clerk, Steno and Other Govt Job Posts. Q. What is the Full Form of HP High Court ? A. Full Form of HP High Court is Himachal Pradesh High Court .